In the grand scheme of things, I know I discovered Tenacious D, an off-shoot of Mr. Show, from the same place I discovered all of the Mr. Show episodes in RealVideo format: fugitivealien.com. Dude was a piracy prophet of only good material. I don’t know if I showed it to Mike or Mike discovered it on his own, but every time I hear Tenacious D, I think of Mike Shannon. I don’t know the last time I saw Mike, but I hope he’s the kind of guy who’d have my back if I ever needed help. He was always a good friend growing up, and often under-appreciated by our peers in the days of uptight socializing and easy ostracizing. He certainly came into his own as time went on, living a much cooler life than I am1. I remember comparing notes, making jokes about Sasquatch, and surviving class with that horrible English teacher– Ms. Guenther. 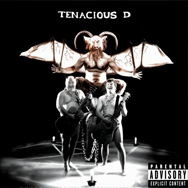 It’s hard to pinpoint any bond that Mike and I may still have, being so many miles and years apart, but I remember the years we spent with Tenacious D (and a few others) very well. And Mike did get me an autographed shirt when he went to see them in concert and I didn’t have a car to leave college to join him. That’s friendship.